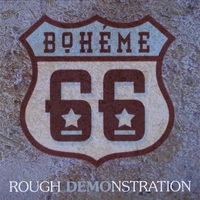 This interesting but uneven debut CD by Boheme 66 has some notable high points along with a few production warts. The standup money tracks are probably High School Reunion (ultra gassed garage rock), Blind Ascension (fuzz bomb hard blues) and Skin Parade (weird Jim Morrison-like psychedelic mood with a long spoken word passage) though some of the other less polished tracks have a creeping attraction as well, specifically Greenfields (hippy dippy alt-folk love song) and Black Lotus Eaters (brooding, dark and multi-layered but still kind of hooky) and even the wildly uneven Wild Wind (again, Doors channeling). The band tears it up live, and some of that comes through here. Worth the listening.